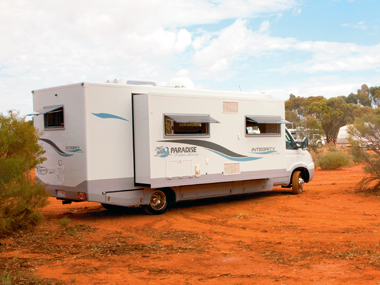 GETTING BEHIND THE wheel of a new Paradise motorhome is no doubt something most aspiring motorhomers would like to do. But since the majority of the Paradise range comes in north of the $200,000 mark, it's usually not a practical proposition. 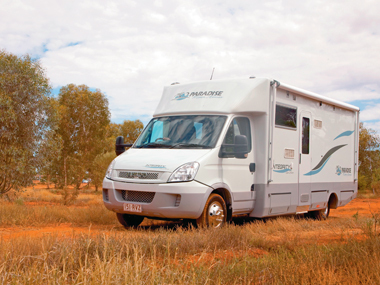 However, the design team at Paradise has been working on building a motorhome with all of the essential features, leaving out a few of the luxury trimmings, at a more affordable price. It seems the company has come up with a solution in the form of the Integrity range. 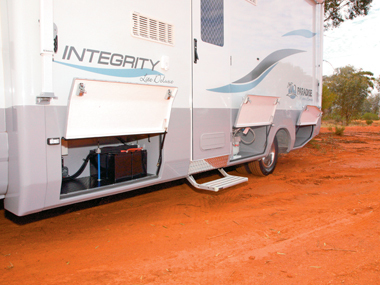 I was recently able to get my hands on a new Integrity - a Lite Deluxe model with a slide-out - all the way out near Kalgoorlie, WA. 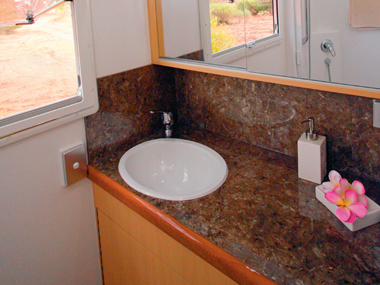 The motorhome actually slotted in rather well with the surrounding red-dirt countryside. The Integrity comes with all of the essential structural and safety features, but with items like the base vehicle, appliances and exterior finish kept to a much tighter budget. 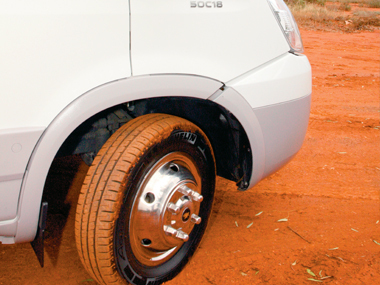 Each unit in the Integrity range uses the Iveco Daily 50C18 as its base vehicle. With a 130kW turbodiesel engine, it's no slouch on the road. While the standard Daily has a six-speed manual gearbox, they are also available with an automated manual transmission (AMT) as an option, as was the case with our test unit. While Ivecos come with swivelling seats, one of the traditional irritations of these rigs is the somewhat awkward location of the handbrake. But this Paradise conversion overcomes this by slightly shifting it to the left. It seems a small feature, but it's a welcome one. In addition to all the usual items, the Daily comes with passenger and curtain airbags as standard. In the load-carrying department, the standard Iveco Daily comes with a GVM of 4490kg, in this case allowing a load capacity of about 750kg. A 5200kg chassis can be ordered if more capacity is needed, but this would require the driver to move up to a Light Rigid truck licence. The Integrity's body is much the same as the rest of the Paradise fleet. The floor, roof and wall frames are all designed for strength and include side intrusion and rollover protection. Add to this the composite walls that are bonded and screwed to the framework and the result is a monocoque-like structure. 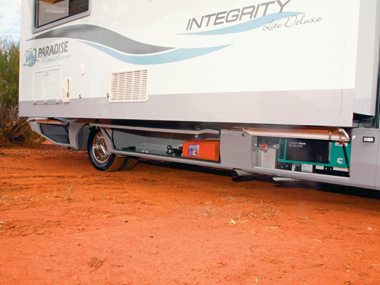 Our review Integrity came with a Paradise trademark slide-out, which feels comfortably like part of the motorhome's structure, rather than an add-on. But if your budget or preferences don't run to slide-outs, don't despair as there's a couple of models without them. 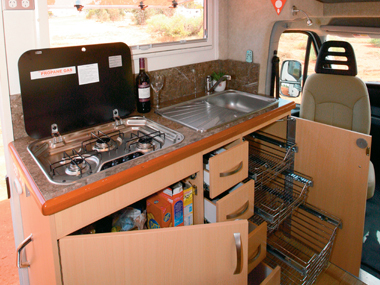 A closer look at the motorhome body reveals seven external storage bins. 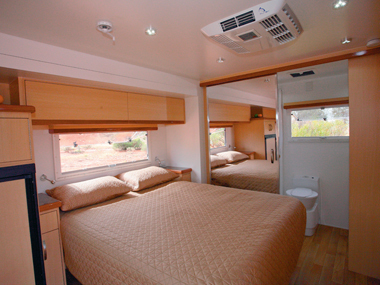 Most are in the under-body area, but one in the slide-out gives access to under-bed storage. Some of the bins are dedicated for items such as gas cylinders, batteries and an optional generator, but there's still plenty of available space. The swing-up doors in the lower bins make access considerably easier. Once inside, the Integrity's layout looks very familiar. A full-width bathroom fills the rear, with the bedroom forward of that. 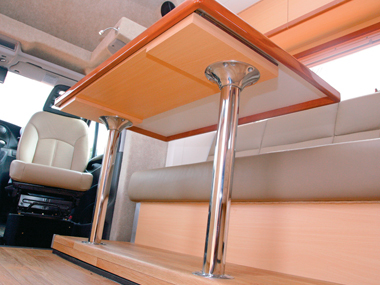 A nearside kitchen bench and offside lounge split the front of the rig. Both cab seats swivel around, making full use of this space. 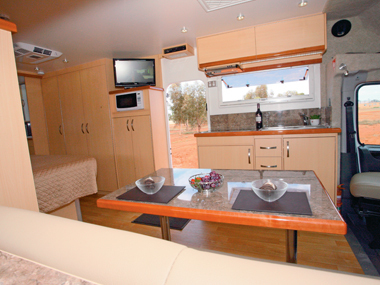 The slide-out is fully stocked, containing the lounge, fridge and head of the east-west bed. Anyone who likes a bit of extra space when they're away from home will be especially happy with this 3.8m (12ft 6in) slide-out. The extra room also means lots more cupboard space, especially for the bedroom. Given the Integrity's layout, the living room is something of a multi-use space. The swivelled passenger sits alone, but the driver's seat can be used in conjunction with the sideways-facing lounge and removable table. The table is mounted on two poles for added stability, and is designed to slide in and out for easy seat access. Opposite the lounge, the kitchen bench does look a little on the small side, but that's partly because the fridge and microwave are separate from the main bench. The bench itself comes fitted with a three-burner cooktop and a stainless steel sink with drainer. 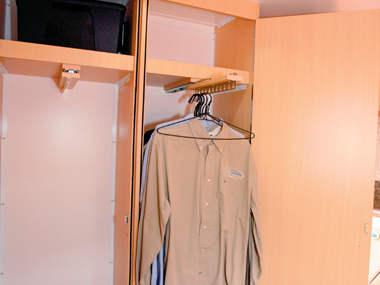 Storage is handled by one cupboard, four conventional and three wire-basket drawers and two overhead lockers. All the cupboards and drawers have self-closing/auto locking features. Part of the overhead locker space is taken up by the electrical control panel. Additional pantry/cupboard space is provided by the mult-use cabinet on the other side of the entry door. The lower half of this cabinet is a shelved cupboard, the mid-section contains the microwave and the top acts as a mounting point for the flatscreen TV. 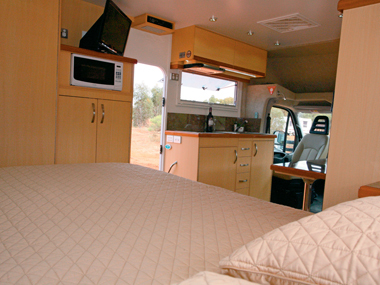 The TV's location means it can be easily seen from either the front seat or the bed opposite. The 184L two door fridge is in a very handy central location in the mid-offside. Like many Paradise designs, the Integrity has an east-west queen bed with a head of overhead lockers and small bedside cabinets - just enough for the basic items. Lifting the base reveals a substantial storage area beneath. Most of the nearside wall opposite the bed is taken up by two large wardrobes and a multi-shelf cupboard. The rear bathroom features an especially large nearside corner shower with a flexible-hose shower, towel rack and sliding screen. A well-appointed vanity and washbasin, with cupboards below and a large mirrored cabinet above, fills the space opposite the shower. A Dometic china bowl cassette toilet, fitted with the standard Paradise odour extraction system, takes the rest of the space. 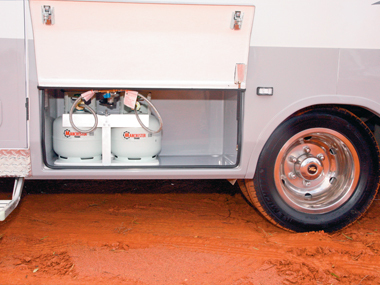 General ventilation is handled by a centrally-mounted fan hatch and large rear-wall window. The Integrity is fully wired for 240V powerpoints and 12V LED lighting. The standard unit is rigged for mains power connection and limited independent camping, but solar panels and a 2.3kVA generator are available as an option. 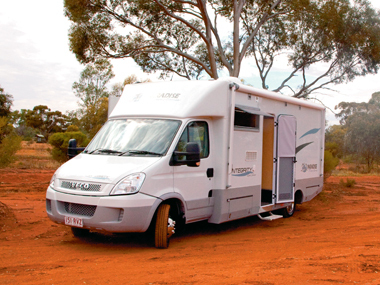 A careful inspection of the Integrity would reveal where a few budget cuts have been made when compared to other Paradise motorhomes. However, it would also reveal that none of the essentials, such as the structure, safety features, even the internal cabinetry and décor, have been changed at all. 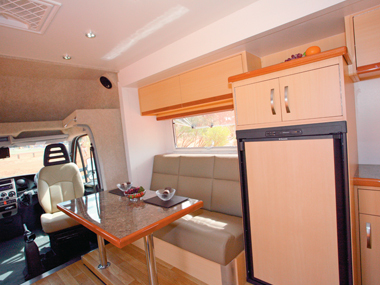 The Integrity is a very impressive rig with a number of layout choices which should suit most customers in the market for a top quality motorhome. WORDS AND PICS Malcolm Street.